The American Embassy in Cairo called on its citizens in Egypt to remain cautious during Monday and Tuesday's Christmas celebrations. In a statement published on Monday, the embassy urged its citizens to observe extreme consideration of security when visiting churches, pointing to earlier attacks that have targeted Coptic institutions. Furthermore, the embassy also requested US citizens to avoid areas of large gatherings, stressing that even demonstrations intended to be peaceful "can turn confrontational and possibly escalate into violence." 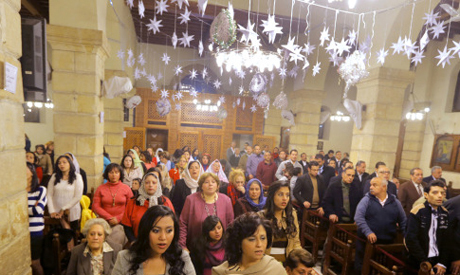 Egyptian security forces heightened their presence around churches on Monday, Christmas Eve, and Tuesday. Numerous churches were attacked following the forced dispersal by security forces of pro-Morsi protest camps in Cairo and Giza on 14 August, which left hundreds dead and thousands injured. In a report released in October, the London-based rights group Amnesty International said upwards of 200 Christian-owned properties had been attacked and 43 churches seriously damaged across the country, and at least four people killed since mid-August. Fears of potential attacks have been heightened since militant attacks increased after the ouster of Islamist president Mohamed Morsi in July 2013. Initially centred in Egypt's restive Sinai Peninsula, the attacks have recently extended to other parts of the country. Meanwhile, the pro-Morsi National Alliance to Support Legitimacy has called for protests to coincide with the 8 January trial of the former president who, along with 14 co-defendants, is accused of inciting violence and murder against opponents in December 2012.